New Beds, Bigger Beds - What to Prune & What Not To - Chit Your Spuds! Blue Delft and grape hyacinths, yellow ranunculus and Tete a Tete narcissus. It's Spring! where to Start? If getting your garden ready for growing seems a bit daunting, and you don't know where to start, Amanda will show you how. Want help on how to create a vegetable garden? Want to grow from seed, but don't know how? Need help trying to figure out how to get the garden ready for spring? Get Amanda to teach you the ropes in your own garden by making an appointment here. 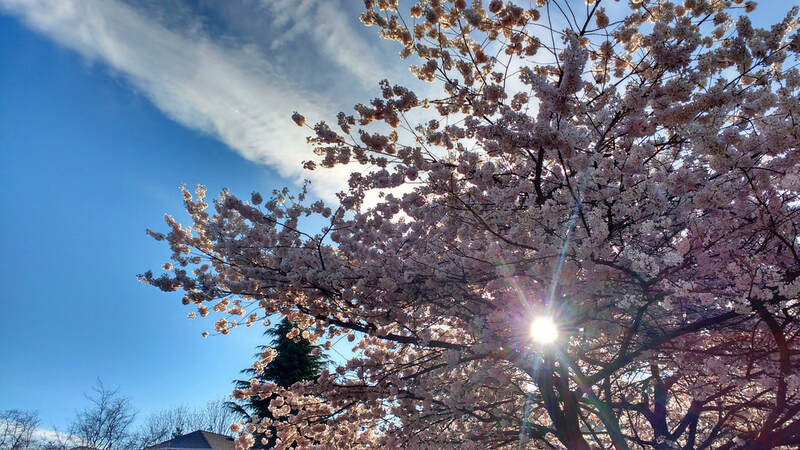 A loaded soft pink Japanese flowering cherry catches the sun as it sets. It is the time of year when landscape companies are hiring crew and homeowners are looking for some muscle to help them with their gardening. I often need an extra hand, and so do landscape companies, especially this time of year. I'm trying to connect landscape companies with willing and able bodies. I don't know if this will work, but I'm willing to give it a go. To fill out the form, click here. Experience and people without experience are accepted. For plant and garden club events, plant sales, garden tours, workshops and other plant related events. ​To post your event here click here. Online Registration Tickets $50 or $60 at the door. This self-guided tour treats visitors to enchanting hand-picked private gardens of all sizes and types over a two day period. This is a fundraiser for the Heritage Vancouver Society. ​More details to follow. 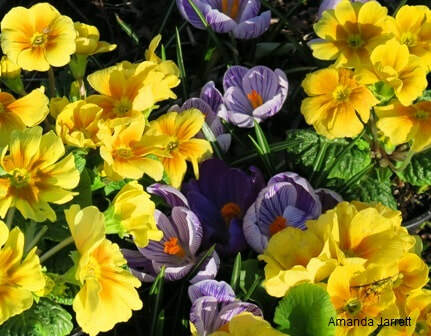 To see highlights of last year's gardens, click here to see Amanda's blog. A lovely white ruffled blue English primrose, Primula acaulis. Here, in the south coast of British Columbia, we have been known to laugh at winter, but our February was no laughing matter. It was a tough one. Winter started off fine with a positively balmy January as the rest of the country suffered through a deep freeze. But February came along and with it came a 6 inches of snow in just a few hours. We were quickly reminded that it was winter after all. Unlucky were the flowering cherry trees that were fooled into thinking spring had sprung. They got hit with below freezing temperatures, snow and wind and by the time the second storm hit, remnants of our early spring were a faded memory. March can be quite unpredictable as winter transitions into spring. Winds, storms, ice and snow are not uncommon and so are delightful balmy days. By the end of the month, spring usually dances her way into everyone’s hearts with longer days and milder temperatures. If March comes in like lion, I wonder if the old adage that it will go out like a lamb, will come true. No matter what March brings, plants know spring is on the way. As they ready themselves to burst forth with lush new growth, gardeners need to don their mud boots and get down and dirty. Preparing for the cold and the wet is part and parcel of gardening this time of year. The payoff is less work next month and happier, healthier plants. Because March is a transitional month, it’ a good idea to keep an eye on the weather. Days easily switch from mild and rainy to below freezing with torrential wind, sleet and yes… even snow. In Vancouver that is a welcoming sight - as long as it stays up in the mountains. If it dips down into metro Vancouver, the wailings of distressed gardeners will be heard all the way to Newfoundland. It’s just not on! If temperatures do dip below freezing, Japanese cherries, dogwood trees, camellias and other spring bloomers might not flower. They will abort their frozen buds. Heavy snow is another concern as it breaks branches and squashes plants. If this happens, gardeners will need comforting with kind words and a hug. Have Kleenex handy. During and after a rainfall, it’s wise to avoid touching plants, cutting plants and walking on sodden soil. Touching and pruning wet plants spreads diseases. Walking on soggy soil squishes it down, compacting it. Safety is another consideration. Plants, soils and tools can become quite slippery when wet. On the positive side, it is a good excuse to stay inside and plan your garden to decide what to do and when. Or go shopping for more plants…. oooh … sounds like a plan! 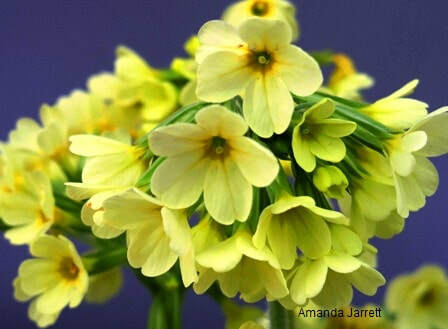 An oxlip primrose, Primula elatior. Easy Roses Do Exist.. Really! Yuletime camellia, C. sasanqua 'Yuletide', broadleaf evergreen, 8 to 10 ft. tall and wide, filtered sun, protected location. Zones 7 to 10. 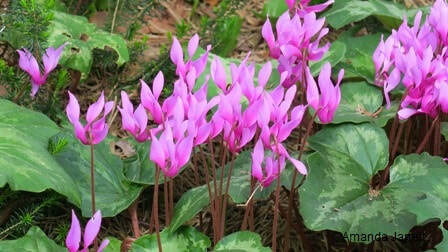 Cyclamen repandum, herbaceous perennial, up to 6 inches, rich moist soil, partial shade, Zones 5 to 7. False rock cress, Aubrieta deltoidea, groundcover, evergreen, herbaceous perennial, up to 6", spreading, full sun, part shade, Zones 4 to 9. Common violet, Viola papilionacea, groundcover, up to 8", sun to shade, Zones 3 to 7. 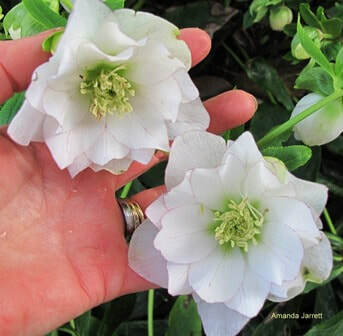 Sparkling Diamond hybrid hellebore Winter Jewels Series, evergreen herbaceous perennial, shade to part shade, Zones 5 to 9. Pink Pearl and Delft Blue hyacinths, fragrant spring flowering bulbs, sun to part shade, Zones 3 to 9. 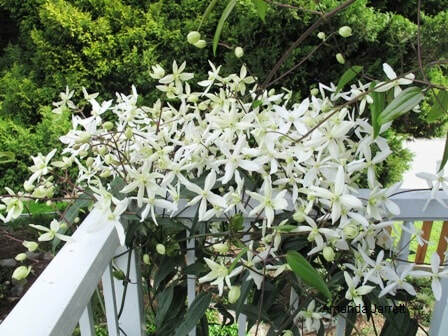 Evergreen clematis, Clematis 'Armandii', evergreen vigorous vine grows to 25 ft, fragrant flowers, sun to part sun, Zones 7 to 9. 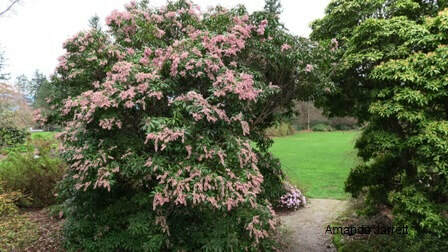 Rubiginosum rhododendron, broadleaf evergreen, 6' to 30' - slow grower, sun to part shade. Zones 7 to 8. 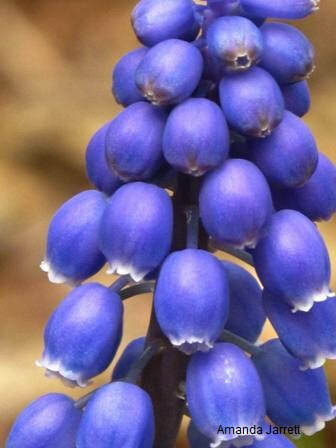 Grape hyacinth, Muscari armeniacum, sun to part shade, fragrant flowers, Zones 4 to 8. 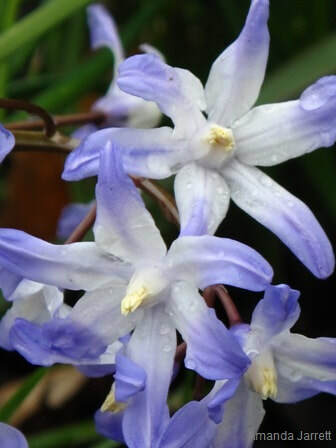 Chionodoxa luciliae, Glory of the Snow, spring flowering bulb, sun to part shade, Zones 3 to 8. 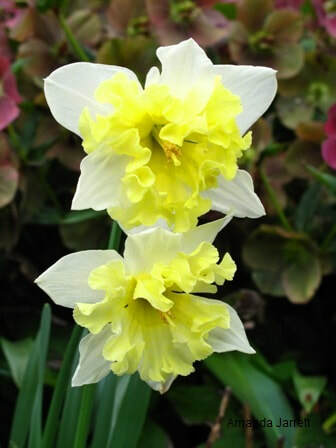 Cassata daffodil, Narcissus 'Cassata', a double corolla daffodil, spring flowering bulb, sun to part shade, Zones 3 to 9. 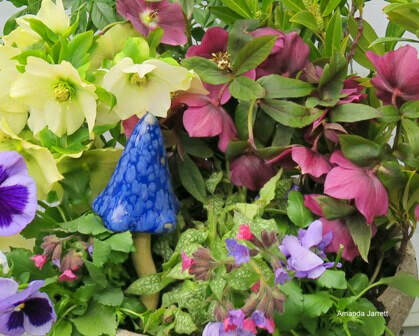 Cream and maroon lenten roses (Helleborus), pansies and blue & pink flowers of the lungwort (Pulmonaria). All prefer shady moist garden locations. Get to know your garden before selecting plants. Know the shady bits and sunny spots and place plants accordingly. 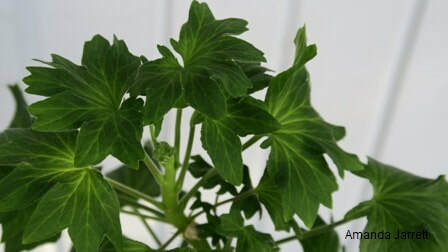 Read plant labels for their growing requirements. Right Plant Right Place: Know a plant’s mature width and height. Read labels before purchasing and don’t discard them. I photograph mine and keep them in my computer. Plant hardy plants now: trees, shrubs, roses, vines and hardy herbaceous (non woody) perennials ex: iris and daylilies. Do you know your garden’s sunny and shady spots? Select plants accordingly. Does the plant need sun or shade? Most plants have specific light requirements; some need a full 6 hours of direct sun while others prefer a more shaded location. Remove plants from their pots carefully keeping their rootball intact. Gently loosen the roots and keep the plant’s crown (where stem and roots meet), is flush with the surrounding soil. Water well every other day until new growth emerges. There is no need to prune trees and shrubs at planting. Do remove flowers, fruits and seeds prior to planting so plants can concentrate on rooting not reproduction. For more on Planting Know How click here. Cloches insulate and are an effective barrier against flying insects. 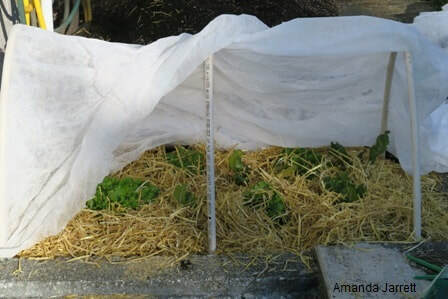 Keep seeds and seedlings warmer by covering them with a floating row cover, known as Remay garden blanket. This lightweight fabric allows air, light and water through. It also acts as barrier. It prevents aphids, cabbage moths, carrot rust fly, leaf minors and other flying pest from infesting plants as they grow. Plastic may also be used as a cover, however, water and air cannot penetrate through. Heat and moisture also builds up during the heat of the summer. In other words, it is a bit more work than the Remay. To make a cloche, use hoops (hula hoops cut in half or pvc stuck into rebar). Pin the ends with fabric pegs or pins designed for the job or make your own with heavy duty wire (coat hangers work well) bent into U shapes. Cloches also extend the season in fall. They are a good thing. ​To learn more about cloches and pest control click here. Core aeration removes plugs of soil so roots have more water and air. It's a good thing. 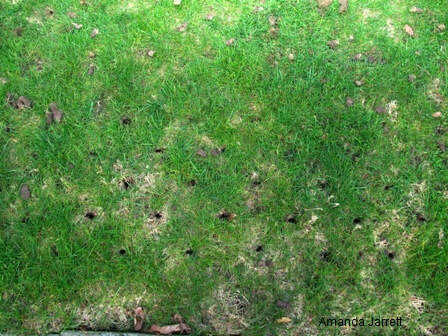 Take care of lawn roots this month by aerating and liming. Use a core aerator when soil is not sodden. Hire someone to do this very necessary but difficult job. Those machines are heavy and cumbersome. Do not power rake as it rips the grass plants apart and does more harm than good. Rake. Use a leaf rake to lift up the grass blades. Optional: After aerating, apply an inch of compost or lawn conditioner. Lime: apply dolopril lime, a coated lime product that is easier to apply and gentler than cheaper hydrated lime. Apply moss killer, then rake to remove the dead moss but do it gently to prevent the spores from resettling on the area. Consider installing a shade garden, patio etc., rather than battling with Mother Nature. For more on Spring Lawn Care click here. If your grass just won't grow, consider microclover. It's easy care and stays green. 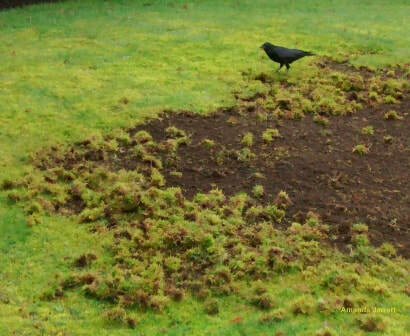 Mossy lawns are favoured by chinch bugs and the crows that feed upon them. Moss grows where the grass cannot. Improve the conditions so it favours the lawn not the moss. That’s the key in thwarting this intrepid weed. Applying moss killer is just a temporary fix. Sure, the moss will die quickly, but it does return if the conditions stay the same. So what does moss like? It prefers shady, acidic (5.0 to 5.5 pH), compacted, moist soil. What does grass like? Generally, turf grasses prefer a slightly acidic soil (6.0 to 6.9 pH), 6 hours of direct sun per day and good drainage with a nice balanced diet. Moss likes to live lean, grass doesn’t; it needs to be fed and watered. Apply moss killer according to the manufacturer’s instructions. Once the moss goes black, remove it but do it gently to prevent the spores from resettling on the area. Liquid moss killer (ferrous sulphate) works quicker than granular. Or use a lawn fertilizer and moss control combo, such as Boost (1-1-1). Improve drainage by aerating with a core aerator in either March or April or in September or October. After aerating, apply ¼ to ½ inch layer of compost or lawn conditioner (topdress), and then apply dolomite lime. Use a drop spreader to apply dolopril lime, a coated lime product. It’s easier to apply and is gentler than the cheaper hydrated lime. Increase light if possible by pruning away offending overhead tree branches that block light. Improve air circulation by thinning or removing neighbouring plants. Keep the grass healthy, vigorous and strong by providing the correct growing conditions and maintenance. Grass won’t grow? Grow a meadow, clover or try microclover. Consider installing a shade garden, patio or encourage the moss for a lovely moss garden. If growing grass defeats you, consider paving and garden beds. It is perfectly acceptable to use Starter Fertilizer for established lawns in spring to get roots growing. Don’t use high nitrogen fertilizer (first number on fertilizer labels is the highest) as it is too early in spring as it promotes leaves instead of roots. Wait until May. Apply organic or slow release plant food high in phosphorous (the second number is highest). Avoid fast acting synthetic fertilizers as they harm the soil ecosystem, making more work for you as you will have to fertilize more often. Avoid applying fertilizer and lime together as the nitrogen in the fertilizer converts to a gas. Wait three weeks between applications. The expansive lawn at Mission Hills Vineyard lawn leads the eye to the striking architecture, the serene Okanagan Lake and the mountains beyond. Cool wet weather is a perfect time for repairing lawns. Select a quality seed for either shade or sun. Fix bare spots by lightly raking the area to rough it up. Mix in ¼ to ½ inch of compost compost, Sea Soil, a garden mix (don't use sand). Add the grass seed and firm into the soil. Water 3 x’s per day, gently but thoroughly. Keep moist until the seeds germinate. After seeds germinate (5 to 10 days) water 2 times per day. Water daily when grass is 1” high. Mow high, mow often and leave the clippings. Set your mower at 2 ½ to 3 inches, no shorter. Mow often so only 1/3rd of growth is removed at a time. Leave the clippings on the lawn as it provides natural and organic nitrogen. It easier than bagging the clippings and dumping them elsewhere. Avoid mowing the lawn when it’s wet. It spreads diseases, compacts the soil and doesn’t give a clean cut. Keep those lawn mower blades clean and sharp. Professional sharpening is recommended especially for reel mowers. As soon as bindweed emerges, keep pulling and continue to do so until it gives up. Hand weed while the soil is moist as it makes it easier. Use the right tool for the job. There are many kinds of efficient weeding tools available. Do your best to remove all the roots, runners and rhizomes. Apply corn gluten, an organic product that kills seeds as they germinate. Don’t apply to garden beds where desirable seeds have been sown as it will kill them too. Once beds have been weeded, apply 3 inches of a wood chips or another type organic mulch on top of the soil. This will reduce any further weeds. For horsetail and bindweed, keep pulling. Don’t dig them out as it makes it worse, just pull baby pull! 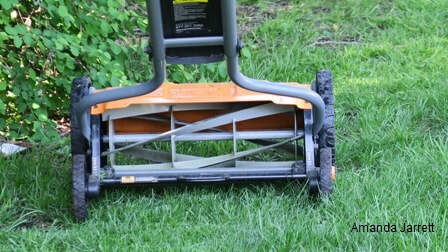 Kill weed seedlings and larger weeds by using a cultivator. This claw shaped hand tool roughs up the soil surface dislodging them. Pick out the weeds and discard. Apply corn gluten to hinder any other weed seeds from germinating. This Green Spike is so unstable its tipping slightly to one side. 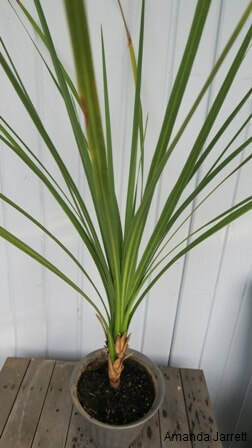 Its lower leaves and leaf tips are also browning. After the roots were severed with a sharp knife it was easy replant the Green Spike in same pot. To remove the plant out of its pot turn it upside down while spanning the top of your pot with one hand. Or place the pot on its side, tap the side of the pot with your hand and/or roll the pot back and forth on the floor. Gently remove the plant from the pot. Loosen the roots with your hand, but don’t destroy the integrity of the rootball. 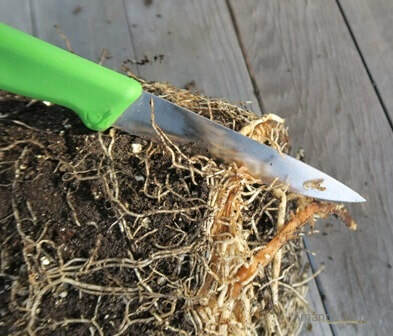 If roots are so tightly bound, use a knife to slice the slits into the sides of the rootball, a few inches apart about ¼ to ½ inch deep. Loosen the roots on the bottom and cut off any that are curled around the rootball. 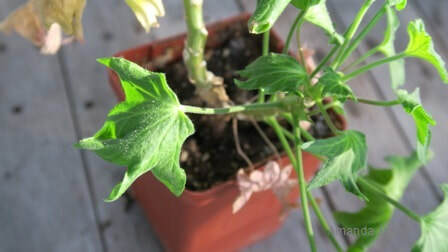 If you want to keep it in the same pot, cut off ¼ of the roots from the bottom and sides. Repot into the same pot with potting soil and a slow release fertilizer. Slice the sides of root-bound plants before repotting. 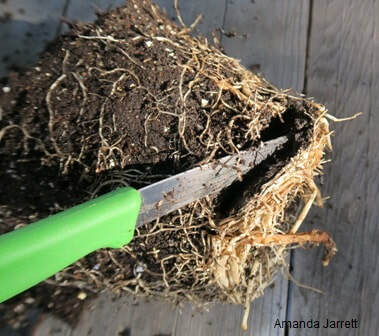 When roots are tightly bound, cut a 1/4 to 1/2 an inch from the bottom of the root ball. When selecting a larger pot, only go one or two sizes larger. Plants often die from receiving too much water and fertilizer when planted in pots that are too big. Don’t cover drainage holes with pebbles or rocks as this IMPEDES drainage. Use potting soil, not garden soil and add a slow release fertilizer. Feel free to add vermiculite if the potting mix is too peaty. Add enough soil to the bottom of the pot so when you place the plant in the pot, the plant’s crown (where the roots and stems meet) are in line with the top of the soil surface. Place the plant in the pot, then add and firm soil around the roots. Don’t put the soil to the rim of the pot, leave at least a 1/4 inch to allow for watering. Water the entire soil surface so the water collects in its drainage tray below. Optional: add transplant fertilizer to the water to help establish new roots. Keep away from full sun for a few days until the plant perks up. Cover tender plants, such as this Mexican Mock Orange (Choisya ternata) when frost is predicted. Click on green text to be directed to another page with more information. 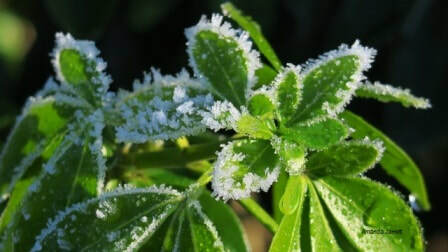 Frost Protection: Protect tender plants from frost especially early flowering ones such as camellia, daphne, Japanese cherry and magnolia. Protect tender ones such as Mexican mock orange (Choisya), New Zealand flax, escallonia to name a few. Use fabric or cardboard, but not plastic as it has little insulating value and doesn’t allow plants to breath. Houseplants & Tropicals: It’s too early to place houseplants and other tender plants outside until mid-April. Get them ready by hardening them off now by gradually acclimatizing them out to the outside. 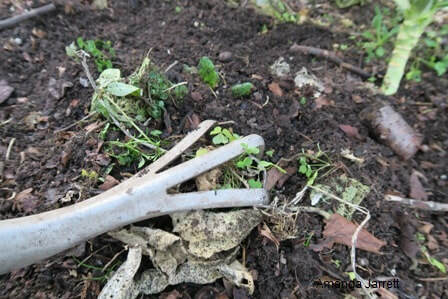 Compost: Activate compost by turning it with a garden fork. Add water if it is too dry and if it is too wet, added shredded newspaper. Greenhouses: Clean and disinfect all surfaces in greenhouses and used pots, drainage trays and labels. 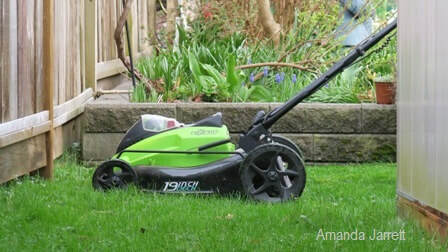 Lawn mower: Service, clean and sharpen blades. Garden beds: Weed and clean up perennial plants (daisies, irises etc.) and debris. Add 3 inches of organic mulch once plants start to grow. Place on top of the soil and around plants. Dividing Perennials: Divide overcrowded aster, bergenia, crocosmia, delphinium, seal holly, daylily, iris, hosta, ornamental grasses, salvia, sedum and other summer flowering plants. Stake: It is a good idea to start staking tall (Delphiniums) and floppy plants (Oriental Poppies), peonies before they become too cumbersome to do so. Place peony rings on peonies and other long stemmed plants that bear heavy flowers that have a tendency to droop. Ornamental grasses: Cut back dead foliage before new growth takes over. Plant: trees, shrubs, lawns, perennials and cool season crops. Cover Crops: If you planted a winter cover crop last fall (crimson clover or annual rye), cut them back and dig them in. Don’t remove them from the beds as you want them to decompose and replenish the soil. Prune roses when they sprout new growth. 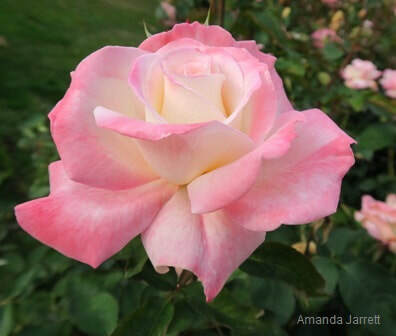 This beautiful rose is a hybrid tea called Secret. When roses start growing that's the time to do some pruning. It usually coincides when forsythias don their bright yellow flowers. For more on spring rose pruning click here. ​Slugs & Snails: Check all plants for telltale eaten foliage and slimy trails. Hand pick them off plants and soil on rainy days and place in a container of salt water. Or, put out slug bait traps and/or copper netting. For more click here. Weed: Hand dig when soil is moist as they come out easier. Kill Weed Seeds: Apply corn gluten meal (organic product that also contains nitrogen) to kill weed seeds before they germinate. Don’t apply to areas where you have sown desirable seeds. 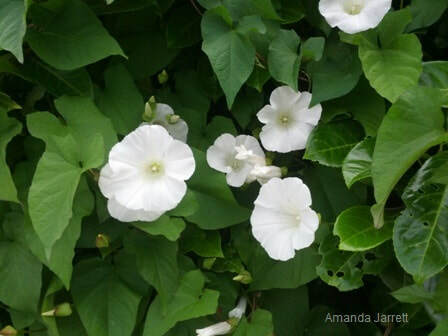 Horsetails & bindweed (morning glory): Keep pulling, especially when they just emerge. They hate that. For more click ﻿here﻿. Potatoes: Plant potatoes when soil is not sodden,which is usually when dandelions flower. Consider ‘chitting’ them beforehand to increase yields and speed up harvesting. See more below. Time to pot up dahlias to give them a head start on the season. This amazing specimen is called Striped Vulcan. Dahlias: Get a start on stored and new packaged dahlias by soaking the tubers overnight. Plant the next day in pots with drainage holes using sterile potting soil. Don’t forget to label with name and size. Water and place in a sunny, frost free location. 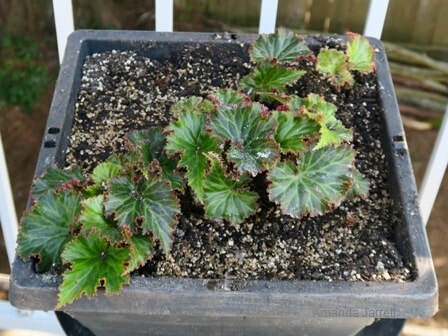 Tuberous begonias: Pot them up with fresh potting soil. Don’t bury the tubers. Place the concave part face up and barely cover. Place in front of a sunny window and water. They are frost tender so don’t put them outside until after the danger of frost has passed and they have been hardened off. Gladiolus: Plant outside in a sunny location two weeks before the last expected spring frost. It takes from 70 to 90 days from planting until flowering. Plant tuberous begonias with the buds facing up. Bury the buds with only a 1/2 inch of soil. Give them bright light and don't allow soil to dry out. These kale seedlings need to be thinned. Use scissors to remove the weak ones and prick out healthy ones with a pencil to replant. Leave up to 3 seedlings in each cell. ​Sow seeds inside. Read seed packets for when and how. Start agastache, alyssum, broccoli, lettuce, lobelia, marigold, nicotiana, lavatera, petunias, sweet peas, peppers, tomatoes, pac choi, cabbage, cauliflower, columbine and hollyhocks. For more info on growing seeds indoors, click here. Sow seed outside. Wait until the soil temperature should be at least 4 degrees C (40 degrees F) and a handful of soil doesn’t drip water when squeezed. Usually that's about the time forsythia flowers. Refer to seed packets for when and how to sow. Sow arugula, beets, broad beans (fava), celery, chard, collards, kale, pac and bok choi, peas, potatoes, radishes, spinach, borage, chamomile, chervil, chives, garlic cloves, calendula, cerinth, forget-me-nots, foxgloves, hollyhocks, poppies, sweet peas. For more on direct sowing click here. Separate healthy, strong seedlings once they have a two sets of leaves then repot into individual 2 inch pots. ​Tender Transplants: Wait until mid-May to plant transplants of beans, tomatoes, peppers and other tender non-hardy plants outside. 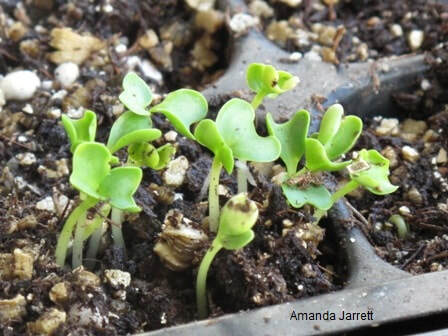 Transplant seedlings: Seeds planted inside last month are probably ready to be moved into larger pots. Select the strongest seedlings when they have outgrown their pots and/or they have 2 sets of true leaves. Sheet mulching (lasagna gardening) makes it easy to make new beds and enlarge existing ones. Clean up garden and vegetable beds by removing weeds and debris. Cut back perennials. If the soil is not mulched, use a cultivator to loosen the soil surface and removes weeds as you go. Add 1 to 3 inches of compost or SeaSoil, triple mix and/or well-rotted bagged and composted manure (sheep and llama manure are excellent). Either lay it ontop of the soil or rake it in to the first few inches. There’s no need to dig it in. If the area has been mulched, move the mulch to one side or place it on a tarp, then add the compost to the beds. Replace the mulch and top it up if necessary so it is at least 3 inches deep. New Beds: Make a new garden on top of the lawn by using the sheet mulching method (lasagna gardening). For more click here. To stop grass from growing into the beds, install edging around the bed perimeter. Houseplants that were in sunny windows might be getting too much sun now as the sun becomes more intense and daylight hours are longer. They should be strutting new growth since days are longer and spring is on its way. They know what’s going on outside! Ones that were in front of a sunny window might be getting too much light now if they prefer less light. Symptoms of too much sun are yellow, bleached out leaves. Older foliage may curl under and new ones are small and stunted. Moving them further away from the window may be all that is needed. Dislodge weeds and seedlings by using a cultivator. Pruning hydrangeas now removes their flowers. It's best to wait until autumn. This lace cap beauty is called Twist & Shout. It’s not necessary to prune everything. Just remove, dead, dying, diseased, spindly and old non-productive branches. Don’t remove more than ¼ of growth from a shrub or tree at one time. The rule of thumb for most plants is to prune them right after flowering. 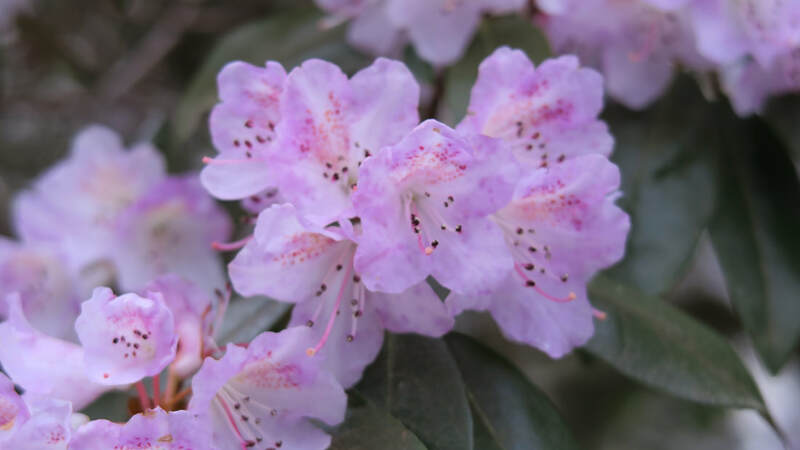 Don’t prune spring bloomers until after they flower:: azaleas & rhododendrons, beautybush (Kolkwitzia amabilis), bridal wreath spirea (Spirea x vanhouttei), apples, crabapple cherries,, forsythia, hawthorn (Crataegus sp. ), hydrangea, lilac, magnolia, mockorange, mountain laurel (Kalmia latifolia), serviceberry (Amelanchier x grandiflora), deutzia and weigela. 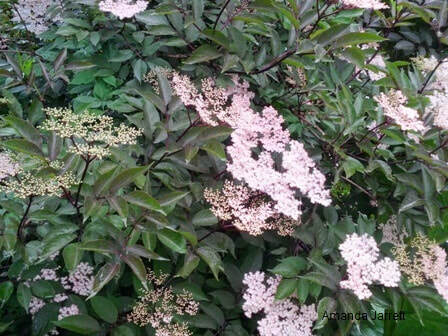 If your elderberry (Sambucus) needs a trim, now is a good time. 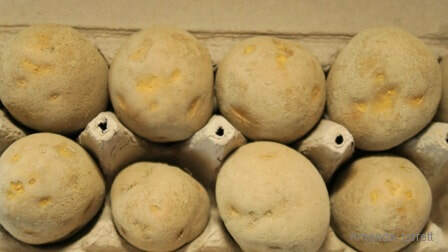 Chitting potatoes hastens harvest and increases production. St Patrick Day, March 17, is not just the time to drink green beer, it's potato planting time! Prime planting time is from mid to late March, but you can plant all the way to the end of May. ​Purchase ‘seed’ potatoes, which are actually small spuds. The ‘eyes’ or sprouts that dimple a potato are the beginnings of stems that develop into a plant. Non-seed potatoes from the grocery store are not certified disease free and don't sprout as readily as seed potatoes. To promote lots of eyes, place the potatoes upright in an egg carton with the end with most of the eyes facing up. If you have many seed potatoes, place them upright in crates with slatted bottoms. This process is called chitting and although it is not necessary, harvests are bigger and earlier than just planting potatoes in the ground. Place the potatoes in front of a sunny window, preferably a cool one, away from frost. Once shoots from the eyes are about ¾in-1in long. For fewer but larger potatoes, keep only 3 or 4 of the shoots and rub off the rest. ​Don’t water until you see their stems emerge from the soil then keep the soil evenly moist. If the soil dries out, the plants will die back affecting the harvest quality and quantity. For ‘new’ potatoes, harvest when the plants are flowering. Either dig up the entire plant or reach in to pick out a few. Wait to harvest the main crop when the stems die down. Don’t harvest straight away. Wait for 3 weeks then harvest. Brush off any soil but don’t wash them as it may cause rotting. Store in a cold, dark frost free place with good ventilation. For more details on Growing Potatoes click here. Cure and store spuds where it is cool, dry and dark. 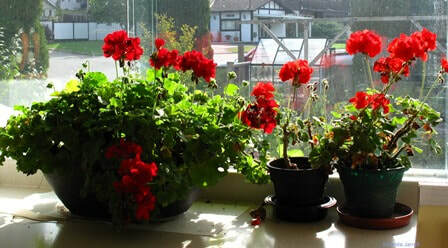 This geranium is drooping, needs daily watering and is obviously in distressed. It’s a good time to repot geraniums overwintered inside, bougainvilleas, hibiscus, other tropicals and houseplants so they will be at their best for the year ahead. It’s a good time to repot potbound plants into larger pots or root prune them if you want to keep them in the same container. The new foliage of root bound plants are the last to wilt. 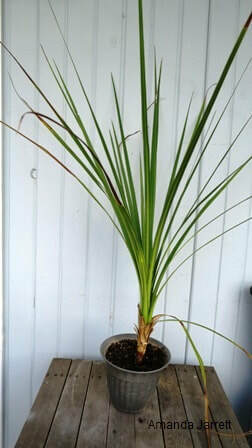 Lower leaves wilt first when roots are pot bound. 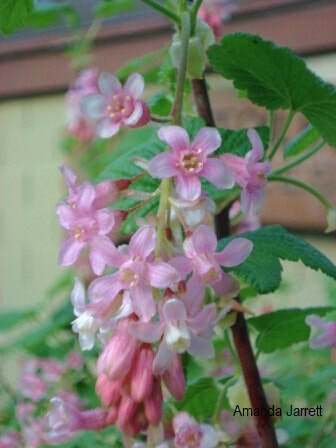 Not sure of the name cultivar, but it's soft pink urn shaped flowers are certainly prolific. Mature Lily of the Valley shrubs can become quite large especially when they are happy, like this grand specimen. A snail hides under the blossoms of a Valley Valentine pieris. 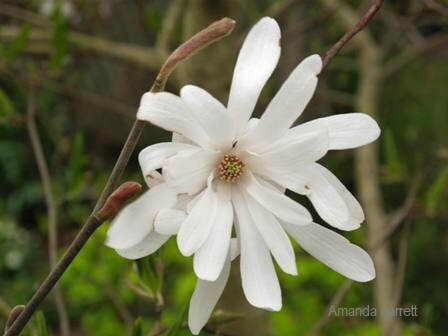 Dorothy Wycoff has thousands of white flowers and contrasting maroon calyxes. Pink Passion bears soft pink blossoms. March heralds the beginning of flowering season for these floriferous broadleaf evergreens. Afternoon shade, moist rich soil and organic mulch promote healthy Lily-of-the-Valley Shrubs. Cream coloured margins contrast with the green foliage on variegated Japanese andromedas. Their white flowers add to their charm. Variegated pieris bring lightness and softness to shady gardens. Their round, woody seedpods are best removed to promote better flowering the following year - if you have the time and patience that is. A versatile shrub that can be used alone or in a grouping. Has something to offer every season. Evergreen foliage provides a great background to other plants while new foliage shouts out colour. Leaves emerge in vibrant orange, reds, chartreuse, maroons, pinks and copper depending on the cultivar and variety. It’s upright, tiered branches are attractive and do not need pruning or shaping. 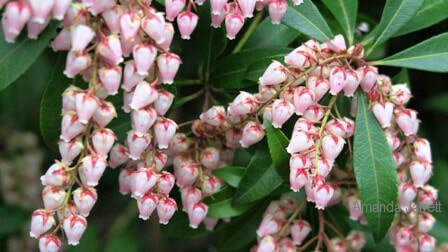 Pieris can become a high maintenance plant if it is not in the right location without correct soil and maintenance. Morning sun, afternoon shade and moist, but well-draining acidic soil rich in organic matter is ideal. Pieris must be mulched with 3 inches of an organic mulch. It does not like sandy soils nor drought. Incorrect conditions create problems. Lace bug insects mottle foliage, which weakens the plant and makes it look pale and sickly. To rectify, add compost, well-rotted manure and other organic matter. Mix at least 2 inches into the soil with a rake, trowel or cultivator, then apply the mulch on top of the soil. Water during times of drought, especially during the summer. If you have the time and patience, remove the spent flowers. Leaving the flowers on and not deadheading right will result in fewer flowers next year. Remove dead stems at their base any time of year. To trim overly long branches, cut back to a strong side branch. Note that the leaves are toxic. A cascade of Valley Valentine pink flowers. New foliage is always stunning in brilliant colourful colours. Valley Fire bears outstanding new foliage in pinkish tones. 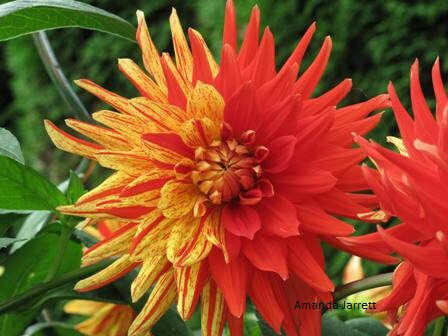 This picture was taken in April when both flowers and new foliage were showing off at the same time - wowzer! Valley Valentine bell shaped flowers are attached with red calyxes that resemble X's. 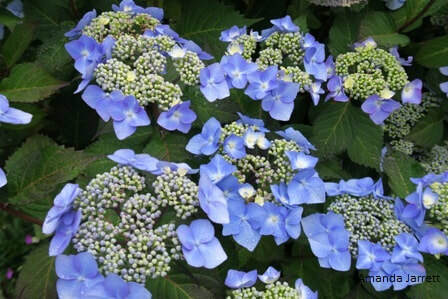 Grape-like clusters full of flowers are the epitome of this beautiful plant. Lace bug damage is evident by mottled pale foliage. This pieris is struggling with lace bugs as it is planted in dry and poor soil that lacks organic matter, no organic mulch. It's also in full sun. While working in Florida as horticultural consultant, it became apparent that there was a need for a book on tropical shrubs. There are so many wonderful shrubs to choose from, so I wrote a reference book to make the selections easier. Ornamental Tropical Shrubs includes pictures in full colour and information about the plants in point form. So if you live in the tropics and subtropics and need a reference book on tropical shrubs, or you just want to have a look-see click here.